Earlier this week I got the chance to attend an evening at the Paisley Thread Mill Museum to celebrate the 'relaunched' display of their amazing archive of sewing supplies, patterns, patents and tools from when the mill was operational (and from sources further afield). Reels of cotton are suspended from the ceiling in the foyer in a rainbow of colours providing a vibrant 'welcome'. 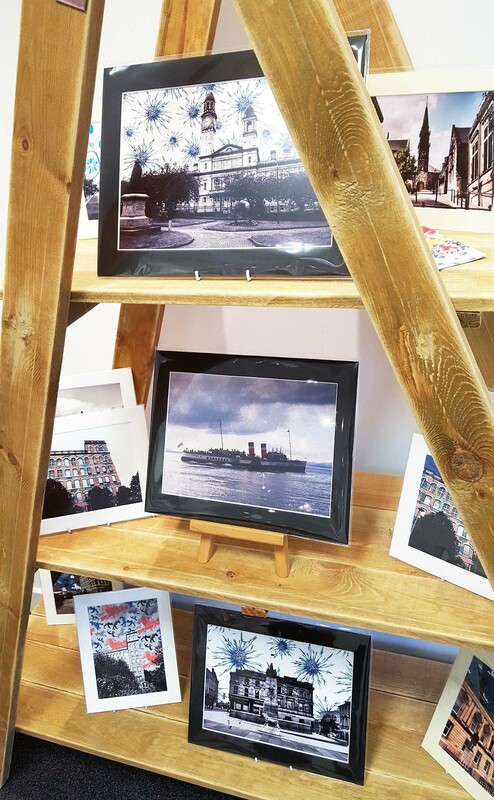 The archive is displayed in glass cabinets on the mezzanine level, including many pieces gifted to the museum from people in the local area. The aim is to preserve the social and industrial heritage and history of the Paisley and Renfrewshire Thread Mills for future education and enjoyment. I've always been a sucker for vintage artefacts, but seeing the old spools and now-vintage packaging with the old-fashioned designs; I was in my element. Just look at the colours! And the typography! We heard poetry featuring the 'Mill Girls' and I imagined snippets of what their lives might have been like, starting work there at 12 or 14; hard graft during the week culminating in the anticipation of going 'to the dancing' at the weekend. I love this miniature sewing machine with the ornate decoration on the side. How sweet but how many stitches has it sewn? How many hands have turned that wheel? What was it's primary sewing function? Finishing tiny pieces perhaps, or hemming, or making lace? The display of all these different types of thread and sewing tools is gorgeous and so inviting, making me want to dig out my sewing box and start making something fabulous or reworking an older, vintage piece - make do and mend at its best! I have my own stash of Anchor mill embroidery threads too in an array of colours (like many people), but it's funny to think they all originally came from this Thread Mill in the heart of Paisley. Looking at these things reminds me of my Nana's old sewing basket and the carded wool I inherited from her, along with a love of knitting (and the know-how - my Nana taught me to knit and there's really nothing like learning first-hand like that). Her knitting always held a faint whiff of talcum powder and her favourite 'toilet water'. So many memories are held, suspended in time, in these things that we keep and treasure and unwittingly bestow on our children and grandchildren. I wonder if my son will be interested in these things one day? Probably not! I remember playing with old cotton reels like they were something so wondrous. The shiny gold of the end-label livery looks so regal here. Reels of cotton ready for weaving? Warp and weft forming the pattern, right to left and left to right. Seeing this old spinning wheel had me thinking of fairy tales like Rumpelstiltskin; weaving straw into gold. The production of textiles that will outlast us all certainly seems like alchemy. It was so nice to see these things in their new setting for all to enjoy, and I left itching to get going with needle and thread. 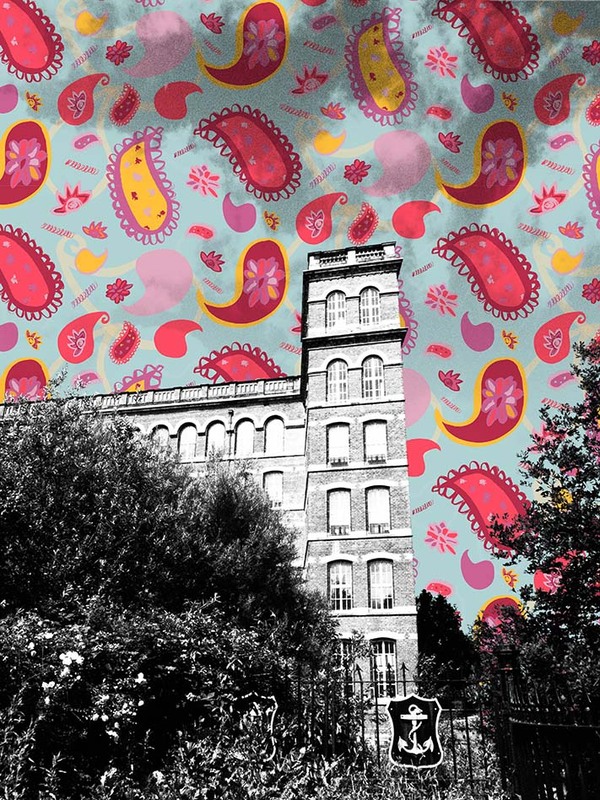 Visit the Paisley Thread Mill Museum on Wednesdays and Saturdays, 12-4pm and get stitching! 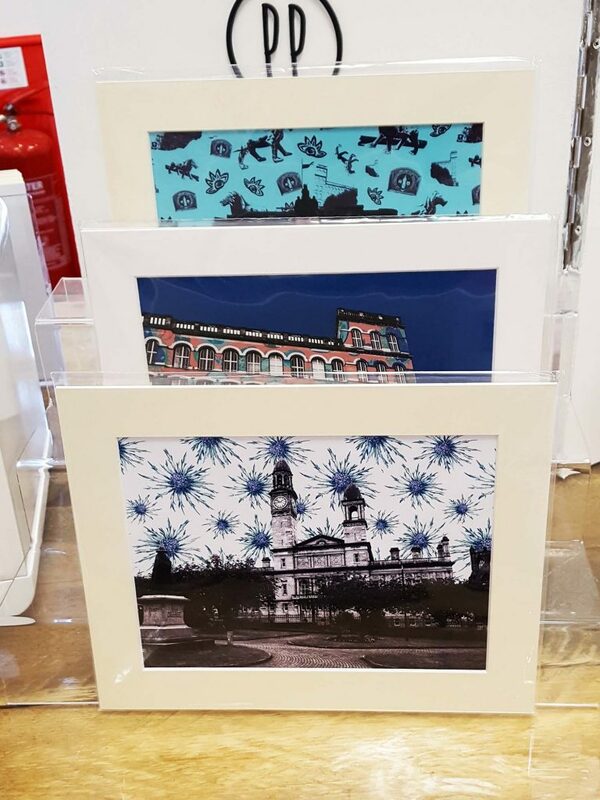 I'm delighted to announce that an exclusive selection of my 'pattern-bomb' prints are now for sale in the InCube Shop on Gilmour Street in Paisley. 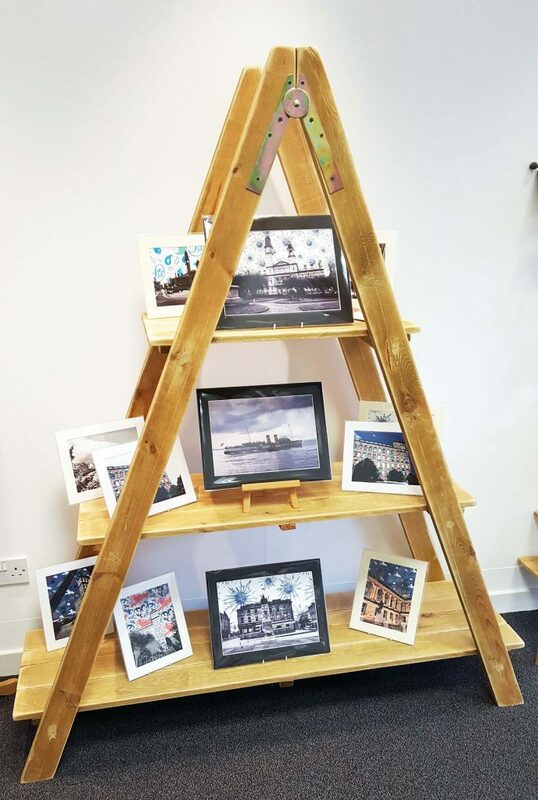 The InCube Shop is funded by Renfrewshire Council to support local design businesses, showcasing handmade products in a bright and spacious 'boutique' environment. 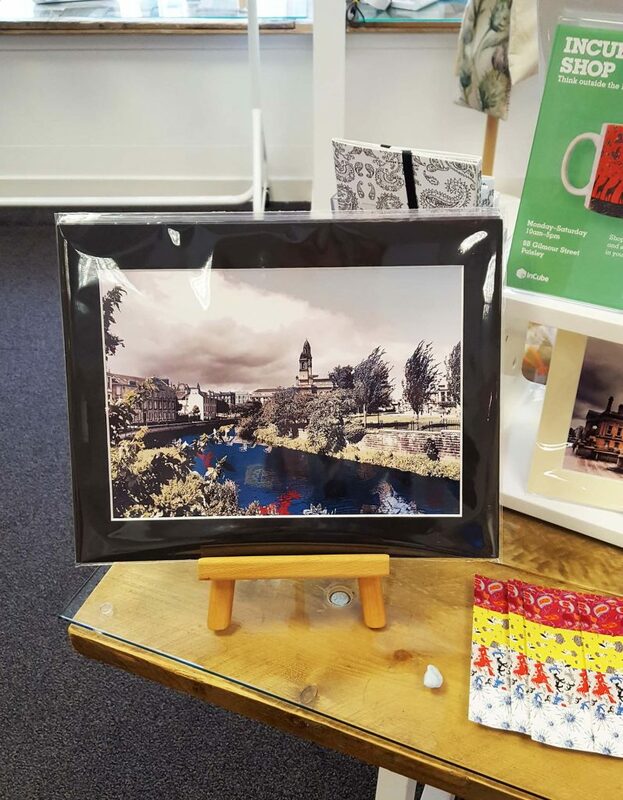 Seeing my prints alongside other designer's work in such a great location in Paisley is a dream come true (especially when I saw people stop to check out my prints featured in the window!). 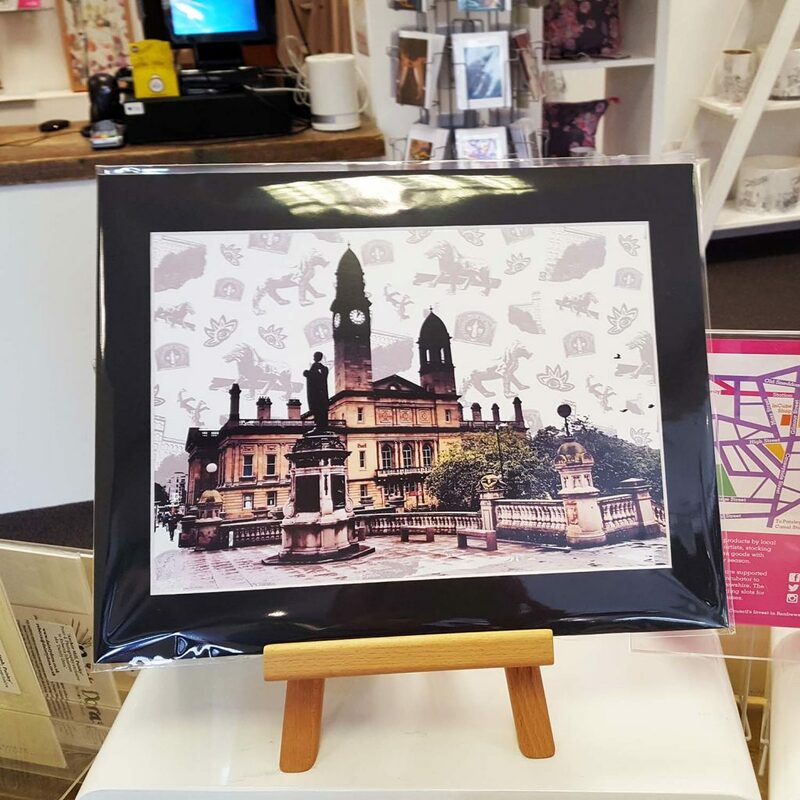 Most of the photography featured in these prints are local Paisley scenes such as the Town Hall, Trinity Church, Anchor Mill and the Cart river. I've also featured The Waverley - those famous red turrets always an iconic sight around Scottish waters - paired with thistles in the sky which almost look like fireworks in the way I've layered them through the clouds. Connecting with some of my fellow designers such as Lil of Gatekeeper Art, Yvonne of Vonne Alley and Karen of Karen Hanvidge Ceramics has made the experience all the more special as a whole community of designer-makers come together to support and encourage each other and discuss 'all things Paisley'. 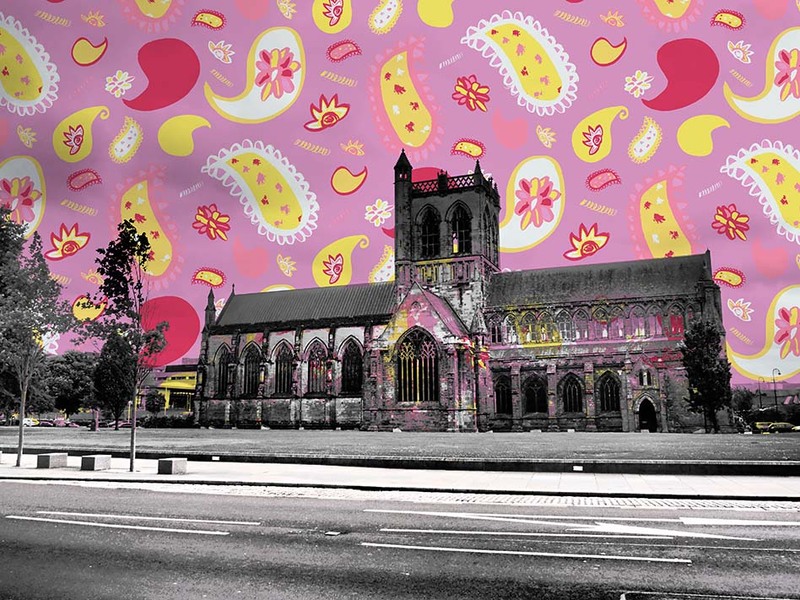 It's a particularly exciting time of course as all eyes focus on the title of City of Culture 2021, of which Paisley is named on the shortlist of five (winner announced December 2017). Over the coming weeks I will be launching a selection of greetings cards in time for Christmas, which will be stocked at the InCube Shop, as well as in my own online store. 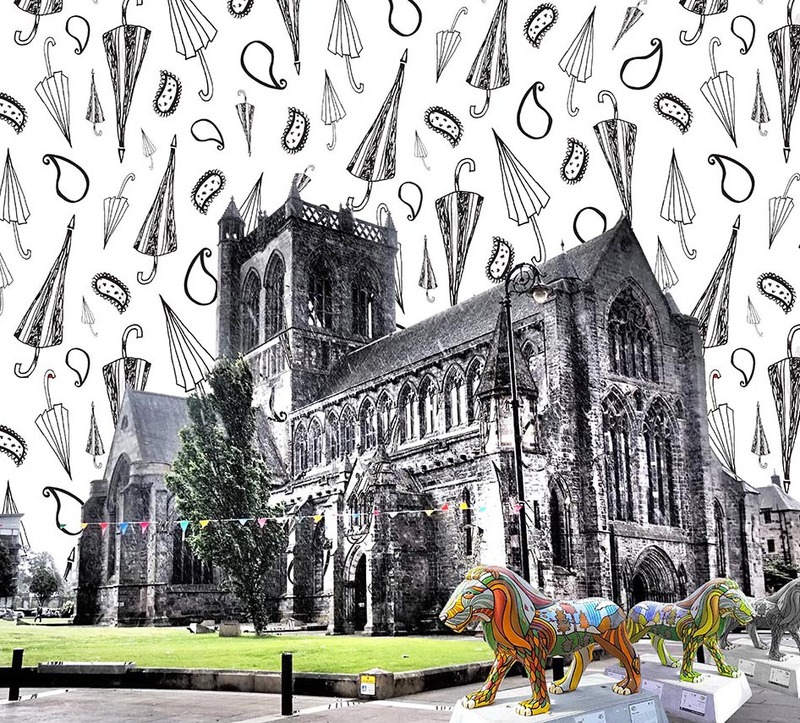 I'd also like to shout-out the historic Paisley Abbey who were my very first local stockist - they have a selection of my pattern-bomb prints all featuring the Abbey but from different angles and using different surface pattern designs: lions, umbrellas and teardrops - oh my! Visit the InCube Shop in person - also a box office for The Spree in October - Monday-Saturday 10-5pm, 9B Gilmour St, Paisley PA1 1DG. 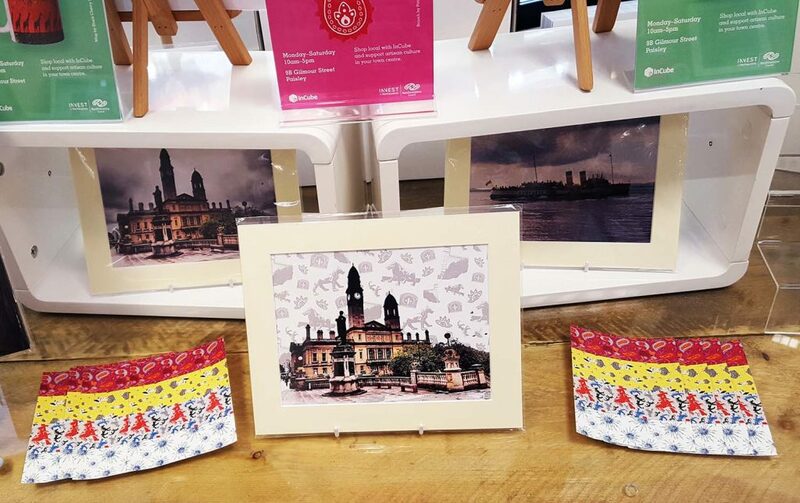 Today I'm proud and honoured to be exhibiting at the PaisleyMake Maker's Market in Paisley Abbey, showcasing my collection of Paisley-inspired surface pattern designs on fabric and in print. Organised by Scotland Re:Designed (SRD), the Maker's Market is part of the Sma' Shot Day festival celebrations which includes a host of other events across the town. As a local girl with Paisley on my doorstep, it was an opportunity not to be missed! I posted last year about my adventures 'behind the scenes at the museum', where I was able to view archival looms, fabric and weave designs at Paisley Museum and how much I wanted to design my own surface pattern concepts inspired by what I had seen. My current collection is only the tip of the iceberg in terms of the ideas and material I have to work with, but so far I've used familiar and iconic Paisley motifs such as the floral teardrop, the Old Coat's Mill Tower and illustrative versions of the lions that were on show at key locations across the town last summer: the 'Pride of Paisley'. For some of the palettes I've used colours from the designs I was able to view in the archive, which feels like another nice tie with Paisley's past and heritage. The Sma’ (or small) Shot was a cotton thread which bound all the colourful weft threads into the warps of the world-famous Paisley Pattern shawls. I love this! And you can say what you like about Paisley, but it's always been a colourful place stuffed with culture and commerce. Today it's going to be even more so. 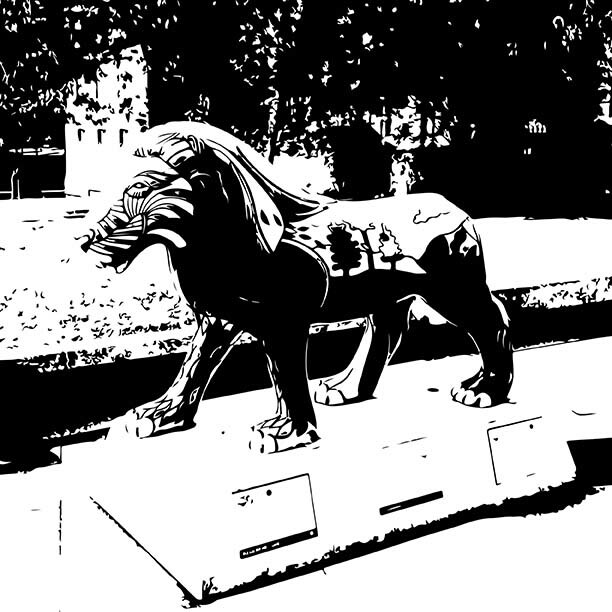 The PaisleyMake Marker's Market and exhibition runs from 1pm-5pm, today.